Cotton Babies Promo Code + Cloth Diaper Deal: Buy 2 Flip Diaper Covers, Get 1 Free, Free Shipping! 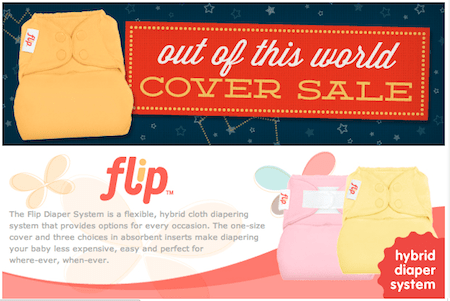 Cotton Babies is having a Buy 2, Get 1 free sale on FLIP cloth diaper covers. You can choose from nine different colors with either snaps or hook & loop closures. Even better, use CottonBabies.com promo code BESTDEAL to save an extra 5% off your order. Plus, economy shipping is FREE!